Prestigious Fires have established themselves over the last couple of years as the UK specialists in manufacturing custom made high quality gas fires and gas fire tables. Using our unique range of CE gas burners, we can manufacture the stunning garden focal point your client requires. Using only the finest materials, attention to minute detail and computer aided 3D design, no job is too difficult. The result is a stunning centrepiece befitting of even the most exclusive of homes. We work very closely with the commissioning architect/designer and consult at all stages of the development. 3D renders are provided during the design process for achitect and client approval before manufacturing commences. Wall Street Interiors, Baroosh Marlow, Commercial. Keith Paine Architects, Wetherspoons, Commercial. Andrew Earl Architects, Carlson Group (TGI Fridays) Indoor fire table concept. Commercial. Constructed from a welded tubular stainless steel subframe and clad in honed Nero Assuluto granite, this stunning garden fire table has at its heart our 19kw square NG Burner. With a removable glass wind shield and black diamond fuel bed this fire table crates a stunning focal point. The table was supplied with a lid to cover the burner when not in use and a fabric cover to cover the table when not used for long periods of time. Installation took 1-2hrs from arrival. This fire table was designed to mirror the seating plan. With a base made from powder coated 4mm stainless steel and a top from nero assuluto granite, this table created a series of design challenges. At the heart of the fire table were 2 x 19kw square gas burners covered in handmade ceramic pebbles. With a removable glass wind shield, lightweight aluminium lids and a fabric cover, the result was a stunning gas fire table. Constructed from a stainless steel subframe and clad on all faces in honed nero assuluto granite panels, this floating fire table has been made to precision tolerances. The gas control hatch was powder coated black to match the base table colour. The unit was delivered and installed in an 11th floor apartment. Commissioned for Wetherspoons, these garden dining tables were made from powder coated 4mm stainless steel bases with Nero Assuluto granite table tops. At the heart of the table were our 19kw square gas burners. Each table was provided with a metal cover for the burner when not is use. 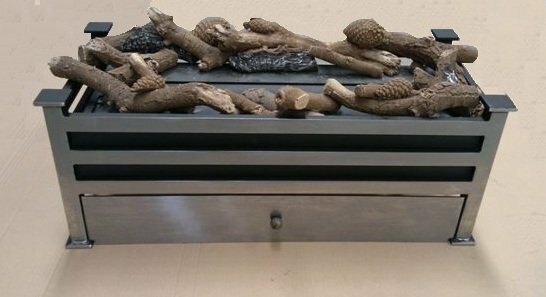 Originally the client approached us with a request for a custom gas fire sculpture. The client deceide it would be quicker and cheaper to install 3 Bahama Fire Tables to create a stunning gaden focal point around which its customers can gather. Commissioned for an American client looking to bring a fire table to her UK residence, this linear fire table had to have its own gas supply. The solution was to design a table which could store a gas bottle. A pullout drawer was designed to house the bottle. The top was constructed from 3mm stainless steel and brushed to achieve a contemporary feel. At the heart of the fire was a 1m linear burner covered in our Ceramic Ice. Approached with a concept, we transformed the concept into a final concept which could be manufactured using various non combustible materials. With a track record of delivering stunning firetables, a choice of unique gas burners, 3D design studio and attention to detail, Prestigious Fires can be relied upon to deliver the centre piece your client is looking for. For more information and images please contact us on 01709 524162.